21° - 23° point designed for particleboard, but works well in all types of wood. Wide thread provides greater holding power. Extra wide thread for greater holding power in pine and other soft, porous woods. Available on Round Washer Head Pockethole Screws only. Designed for hardwoods such as Oak and Maple. Available on Pockethole Screws.. The "All-purpose" thread. Designed for greater holding and less strip-out in all woods. The Hi thread provides greater holding power in wood studs. The Lo thread reduces binding in metals studs, while allowing for greater holding power. The Quickcutter™ Thread allows for faster penetration and stress free driving in dissimilar materials. Also known as twin lead. 21° - 23° point is typically used for hinge attachment in hardwoods. 30° - 45° point with thread designed specifically for use in sheet metal applications. Patented QuickCutter™ Thread for faster stress-free driving. Minimizes pre-drilling in even the hardest woods. The extra coarse thread provided greater holding power in the wood. For reduced torque, quicker starting and penetration, as well as reduced splitting. Self-piercing point instant starting, quicker penetration and faster stress-free driving. Self-piercing point for light, medium, and heavy gauge metal studs. 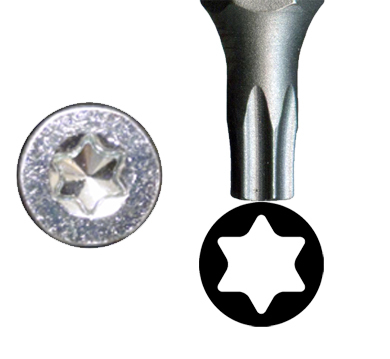 Torx Screws allow a user a six-degree angle when driving the screw and the bit will still engage and drive the fastener.